There are different kinds of shiny materials. Consider the difference between a shiny metallic object, and one made out of a glossy nonmetallic material (like plastic or ceramic). This page will explain some simple techniques for (approximately) mimicking the appearances of these materials using shader settings in the Blender Internal renderer. For all the following manipulations, start a new Blender document, get rid of the default cube, and replace it with a UV sphere. Set it to be smooth-shaded. Change the lamp falloff to be inverse linear, just to make the scene brighter. Assign the sphere a new default material. It is the settings of this material we will now proceed to play around with. For a plastic or glossy effect, give the material a diffuse colour, but leave the specular colour at white. Increase the specular intensity to something like 0.9. 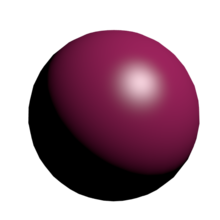 Now change the specular colour to be the same as the diffuse colour. (The easy way to do this is to bring up the specular colour picker, click on its eyedropper icon, and use the eyedropper tool to click on the swatch showing the diffuse colour.) Also lower the specular hardness from its default value of 50, to something like 25 or even 12. This will spread out the specular highlight, giving the impression of a surface that is shiny, but not perfectly smooth. Also lower the diffuse intensity, to something like 0.05. To make the metal more convincing, you may want to choose a more typical metal colour, like grey, copper or bronze. Let’s try for a glazed-ceramic look, or perhaps some dark, shiny stone like obsidian. Set the specular colour back to white (the easiest way to do this is to switch to HSV view in the colour picker and set the S(aturation) value to 0). Increase the hardness to something like 200 to narrow and intensify the specular highlight. Leave the specular intensity high and the diffuse intensity low. To get an even more sharply-focused highlight, change the specular shader model from its “CookTorr” default to “WardIso”. The “Hardness” parameter gets replaced with a “Slope” instead; leave this at the default 0.1. This page was last edited on 16 April 2018, at 10:19.